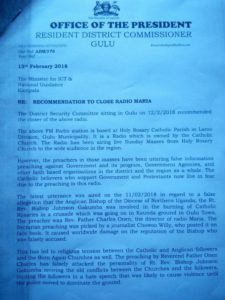 KAMPALA – The Catholic Church-run Radio Maria in Gulu faces shutdown after the Resident District Commissioner Capt. Santos Okot Lapolo asked ICT Minister Frank Tumwebaze to take action. Capt. Lapolo accuses the Christian broadcasting station of airing anti-government information during their live Sunday masses, among other accusations. “The latest utterance was aired on 11/02/2018 in regard to a false allegation that the Anglican Bishop of the northern Uganda diocese Rt. Rev. Johnson Gakumba was involved in the burning of the catholic rosaries in a crusade which was going on at Kaunda grounds in Gulu,” Lapolo write. He said the sermon by the Gulu Radio Maria Director Rev. Fr. Charles Onen had caused tension and revived old inter-religious tensions in the region forcing the security committee to meet on February 12, and recommend it’s closure. “There is overwhelming evidence in the radio broadcast every Sunday,” Capt. Lapolo wrote. Radio Maria Gulu,is housed at the Holy Rose Catholic Parish in Laroo, Gulu Municipality. 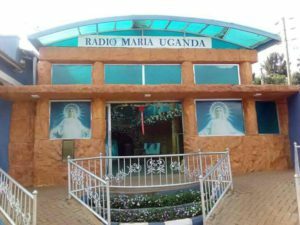 It is one of the 11 stations run by Radio Maria Uganda across the country, under the World Family of Radio Maria owned by the Catholic Church. The Catholic Church has not yet responded to the allegations by the RDC but it is understood that the Radio Maria National Board headed by Mr Emmanuel Katongole would respond to the threats by the RDC. According to the Radio Maria Uganda website, the broadcaster’ s mission. Capt Lapolo’s letter to ICT minister recommending the closure.